Running late. If I don’t get this stuff on-line before 8:00, it shows up as the next day, but trust me, it’s Sunday. A very confusing Sunday. 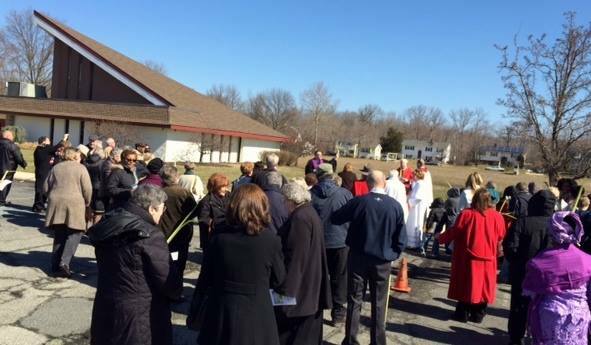 Some time ago, the three local churches – Presbyterian, Roman, and Episcopal – had decided to have an ecumenical Palm Sunday “opening” at the Presbyterian church, since it is the most centrally located. Our services begin at 10:00, but the other two don’t start until 11:00, so this event was scheduled for 10:45, to give folks time to get back “home”. The details were announced in church last Sunday, but folks forget, and a lot of people come to Palm Sunday and Easter who don’t normally attend every week, and even those who heard the announcement probably didn’t all remember it. There was a large write-up in the newsletter, but unfortunately, the rector did not get his article to me until Saturday morning. I had the thing on-line before noon, but that didn’t give the congregation time to “read, learn and inwardly digest” before they went to bed. So we had some people coming in at 9:45 as usual, and none to happy about having to wait an hour, but willing to ride over to Good Shepherd to see how this was going to work. Considering that is was a bit nippier than expected for this time of year, and the service was outside, we had a fair turnout. (I’m the redhead in the alb, “straight down the middle”, and no, I did not plan it that way.) The three clergy read portions of the service, the Presbyterian minister, who has a fabulous voice, lead us in All Glory, Laud, and Honor, and we dispersed to our home parishes. Because of the crowd, we had planned on two Chalicists, myself and the white haired gentleman standing next to me, but we discovered the Altar Guild had only put out one cup. Trying to do signals to get somebody to go to the sacristy, which is in the back of the church, to get the other chalice, short of waving our arms and yelling “yoo, hoo”, but finally Ken just backed off and let me do it by myself. When the head of the Altar Guild came up for Communion she whispered to me, “Did you need something?” “Yes – another chalice.” “Oh. Well. Too late now.” Hmmm.